PAPERSHOW STARTER KIT for MAC/PC... 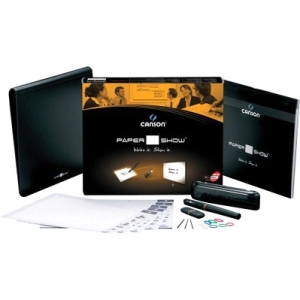 The complete kit solution to start with PAPERSHOW: (1) PAPERSHOW digital pen, (1) PAPERSHOW 256MB USB key, (1) PAPERSHOW notepad A4 format (24x32cm) - 30 sheets for printing PAPERSHOW in 8.5" X 11" Printer Paper. Accessories supplied: Pen: 1 AAA battery, 3 ink refills, 4 colored rings to personalize the pen; Key: 4 colored rings to personalize the key, 1 pen holder to carry the key and the pen, 1 binder to carry and file the PAPERSHOW printed sheets. Platforms: Mac OS X v10.4 Tiger, Leopard, Snow Leopard OR Windows XP (SP2/3), Windows Vista, Windows 7 (32-bit).